The National Museum of American History (NMAH) is part of the Smithsonian Institution located on the National Mall in Washington, DC. 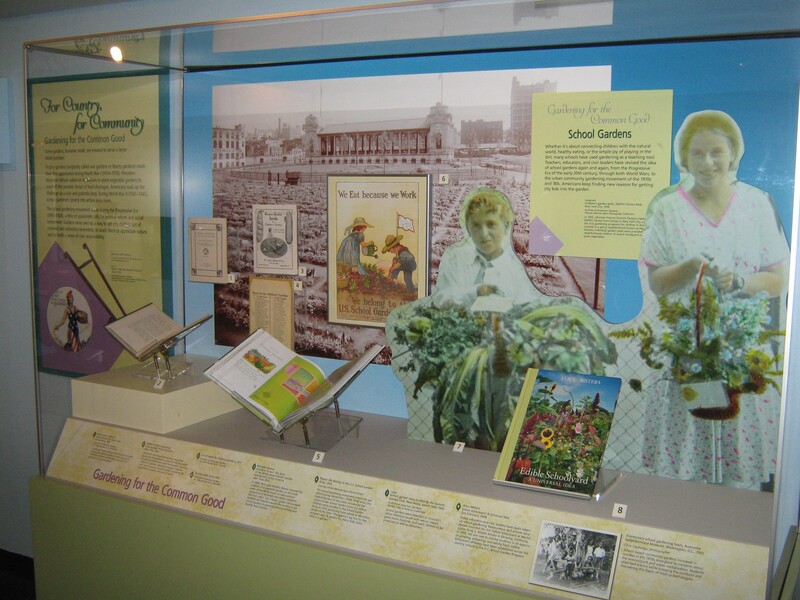 Opening in 1964 as the Museum of History and Technology, it was renamed in 1980, and in recent years was renovated to add new exhibition spaces and an education center. The NMAH collects and preserves more than 3 million artifacts. 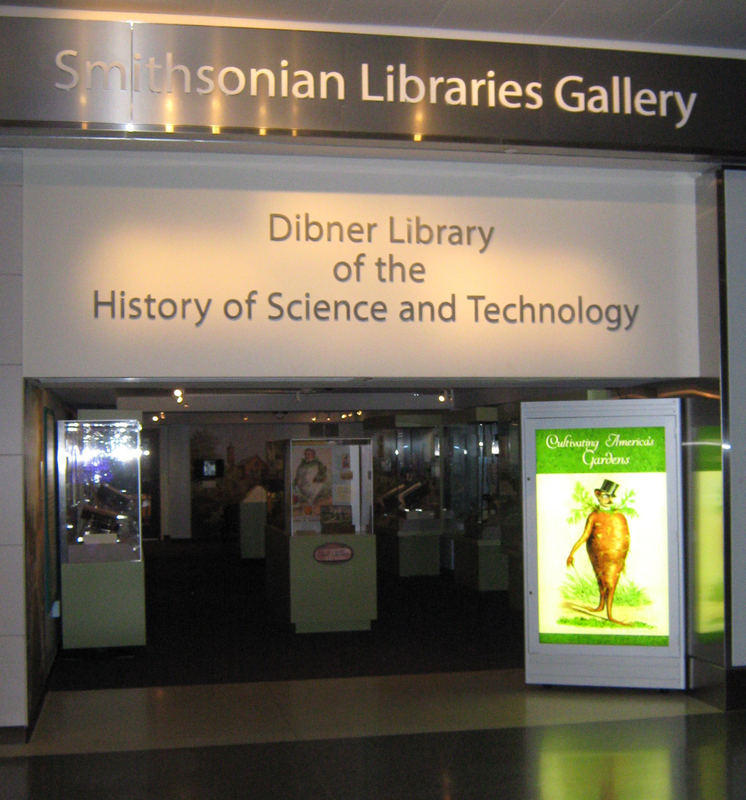 In addition, the NMAH’s Library (one of 21 branch libraries in the Smithsonian Libraries system) supports research in all areas of American history, including social, cultural, political, and economic events and development, along with their impact on everyday American life. 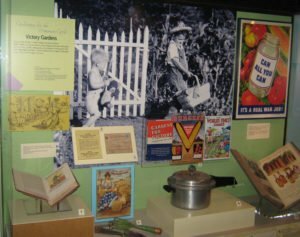 Its collection includes over 120,000 book titles, 45,000 volumes of bound serials or periodical publications, and 460,000 trade catalog items (catalogs and books that were once part of the merchandising of American business, representing over 36,000 companies). 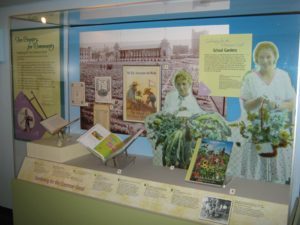 The library has preserved garden books as well as seed and nursery catalogs from 1830 to present, a rich mine of information for botanists, historians and garden designers. The Smithsonian Libraries Exhibition Gallery’s current exhibit through August 2018, Cultivating America’s Gardens (First Floor West of the NMAH) utilizes books and objects from the Smithsonian Libraries and Gardens collections, to “take us on a special kind of garden tour.” It also stimulates the visitor to consider future visits to various gardens referenced in the exhibition. In particular, Bartram’s Garden in Philadelphia founded in 1728 has adopted an impressive River Garden Vision 2025 strategic plan, that nearly 300 years since its founding, reflects a vigorous commitment to its botanical heritage and an enduring sustainability. Five impressive American botanic gardens are also recognized for their promotion of conservation, as nurturing homes to collections of plants: Harvard University’s Arnold Arboretum in Boston established in 1872; the New York Botanical Garden established in 1891; the Missouri Botanical Garden opened as a public garden in 1859; Fairchild Tropical Botanic Garden covering 83 acres in Coral Gables, Florida, established in 1938; Desert Botanical Garden in Phoenix founded in 1939 to conserve native Arizona landscape and to focus on arid land plants of the world. 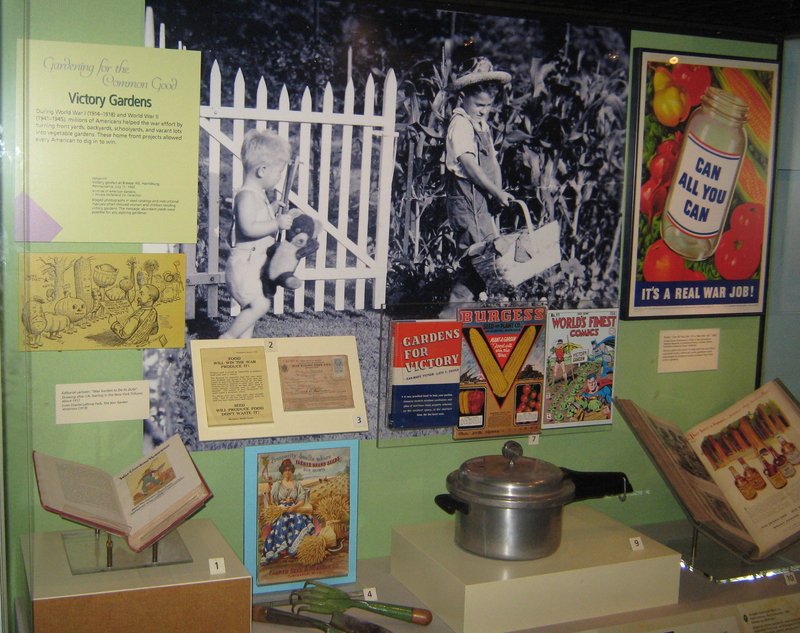 Cultivating America’s Gardens explores several subjects: Gardening for Science, with display cases on Botanizing America and Botanical Gardens; Gardening for the Common Good, with display cases on Victory Gardens during World War I and World War II, and on school gardens; Gardening for the Environment, with a display case on Sustainable Gardens; Gardening as a Link to the Past, with a focus on Colonial Revival Gardens; Gardening to Impress, with its focus on World’s Fairs and Wealth on Display; Rolling Out the Green Carpet, with a display case on the rise of the lawn; and Gardening as Enterprise, with a focus on plant breeding and selling seeds. This local and organic food advocate was especially appreciative of the exhibition’s focus on Gardening for the Environment and the emphasis on the “growing environmental awareness” which has made gardeners ask: How can we make our gardens and great spaces both beautiful and beneficial. Little surprise that prominently on display was a copy of Rachel Carson’s Silent Spring (Boston, 1962) which was “influential in changing America’s attitude toward pesticides and herbicides.” Less familiar was the role of Jens Jensen, an early proponent of using native plants to create gardens in harmony with the natural environment. 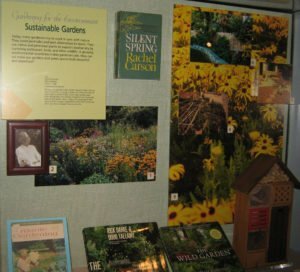 Deserved recognition was accorded JI Rodale’s Organic Gardening and Farming and his pioneering advocacy for chemical free, organic gardening practices for healthful living, a radical idea in the 1940s. 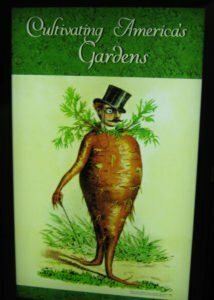 Unfamiliar to this visitor was William Robinson’s The Wild Garden, first published in 1870, which was first to introduce the idea of the sustainable garden. Robinson rejected fussy and labor intensive Victorian flower beds and designed gardens inspired by the natural habitats of North America and Europe. This approach has seen further emphasis by landscape designers Rick Darke and Douglas Tallamy (described as two giants of the natural gardening world by Anne Raver in the NY Times) in Landscape: Designing for Beauty and Biodiversity in the Home Garden (Portland, OR 2014) also referenced. Darke and Tallamy note that by incorporating native plants and water features, home gardeners provide food and shelter for pollinators and wildlife in addition to creating beauty. Three photos stood out: Phoebe Gilpin’s Retired Lawn, of a transformed garden with drought-adapted native grasses in San Rafael, CA, where water use has been restricted; Lawrie Harris’s The Concrete Jungle, creating beauty on an urban Philadelphia block with potted plants; and a beautiful photograph of a planting of Black-eye Susan (Rudbeckia) wildflowers native to North America and a popular choice for pollinator gardens, designed to attract pollinating insects. This is an exhibition to savor. 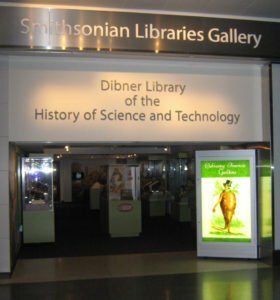 But if unable to view in Washington, DC, the links above to the various subject areas are full of details and images from the exhibition.